Ever thought about trekking in the higher altitudes? Worried about losing your breath? There is a technique that can help you to not only explore the majestic heights but enjoy it in every step of the way. 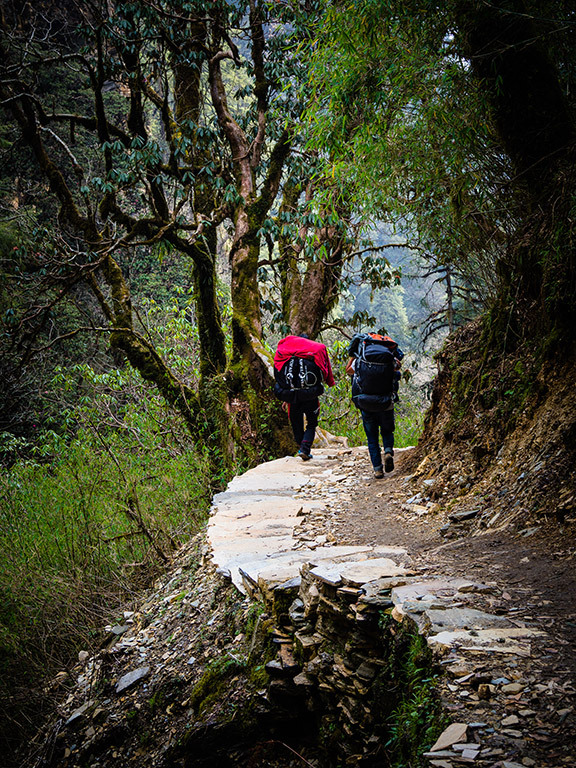 It’s called the Sherpa Step, an important technique to acclimatize yourself and avoid altitude sickness while undertaking the adventure travel in Nepal. Sherpas, the native Nepalese mountain people, who are known for the display of physical prowess at extreme altitude, hike up steep hills in a distinctive style called the Sherpa step. It is a particularly useful technique for saving energy when carrying heavy loads up the inclines where there is little oxygen in the air. The Sherpa step is also used to help trekkers acclimatize to the altitude, thus preventing altitude sickness. Trekking in the Himalayas such as the Everest Gokyo lake trek requires participants to cover long distances as well as negotiate long ascents and descents. To achieve these objectives, the Sherpa step will be your friend and guide. So, how does it work? When you find yourself tired and really short of breath, it’s time to slow things down a bit. Take smaller steps, breathe as you walk and slow down. Remember! Each step should be taken in about 3 seconds. Although it feels awkward at first but trust me, it helps! Our treks such as to explore the Annapurna base camp or the Everest base camp tours are led by Tshering, a native Sherpa from the Khumbu Valley in Nepal. As we get higher in altitude, Tshering will pace the group by teaching the Sherpa step. “Without Tshering I would not have made it to 17,000 feet (EBC). He saw me struggling with the climb and the altitude on the first day in the mountains and took the time to teach me the "Sherpa walk", which allows your body to regulate breathing and heart rate much more efficiently.”, Tomasz EBC 2018. Once you master this way of walking, you will be able to climb for many hours a day, be it during the Gokyo lake trekking or while going for the Everest adventure treks. Join us! Driftwood Adventure Treks will be going to the Gokyo Lakes during November 4-17, 2018 and to the Annapurna base camp during April 12-25, 2019.